Traipse through your local department store and you will find a barren landscape virtually void of decent masculine fragrances. Alright I’m being dramatic, of course there are a few noteworthy ones (mainly older releases), but on the whole the majority; your Calvins, Hugos and your Pacos, are definitely essays in quantity over quality. A good masculine is hard to find, it’s true, but it’s not entirely impossible. Tom Ford is a man that cares about quality. His fragrance line, especially his signature collection, is a cut above most designer offerings (and is priced accordingly) and he has most definitely crafted out his own style, that off opulent, classy and smart fragrances with a tiny touch of the shock factor for which he is infamous. Noir (pronounced “Noo-ahr” if you are Tom Ford) is the latest masculine addition to Tom Ford’s signature stable and it is in good company, joining such esteemed fragrances as Tom Ford for Men, Tom Ford Extreme and Grey Vetiver. But where the other TF masculines are elegant examples of citrus, woods and/or vetiver, Noir is a essay on resins and powders that, dare I say it, almost feels like a masculine rendition of the Oriental Queen that is Guerlain’s Shalimar. Now that I’ve mentioned a ‘Manly Shalimar’ you’re probably thinking that Noir is all vanilla and powder, and yes it is, but not to start with, that stuff comes later. In the beginning Noir is bitter, green and spicy just to the right degree. I enjoy the fact that it feels relatively dry and dusty in the opening, which makes for a pleasant contrast to the more plush aspects that develop over time. As the initial harshness fades Noir becomes incredibly warm and powdery. The dustiness remains prominent and shrouds a blend of softly spiced rose and iris with beautifully refined dust. There is a little touch of something retro-barbershop hidden beneath the more lavish aspects, and whilst it may only be a subtle hint it stands to remind you that Noir, which really could be considered as unisex (can’t everything? ), was made with the dudes in mind. Then comes the best part: the base. Noir’s base is very much a tug of war between rich balsams and smooth, powdery vanilla & leather and this is the part where Noir is at its most Shalimar-esque but It’s nowhere nearly quite as delicious as Shalimar (or utterly mind-blowing for that matter) but it definitely feels as it could have been cut from the same cloth, or at least a reproduction of Shalimar’s print. Noir is available in 50ml and 100ml Eau de Parfum with prices ranging from £60-£75. Image 1 johnlewis.com. Video via Tom Ford on YouTube. Notes via Basenotes. Posted in Masculine, Oriental, Perfume Reviews, Tom Ford and tagged 2012, Fragrance, Masculine, Movember, Noir, Oriental, Perfume, Tom Ford. Bookmark the permalink. Agreed. We don’t need another Noir, Tom, or even “Noo-ah”. It does sound like a very good masculine though. Very much enjoyed the video. Even Tom’s voice is handsome. 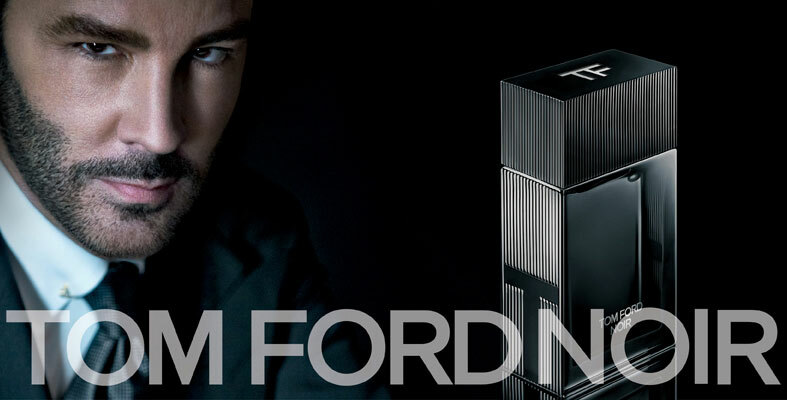 Tom Ford is my ultimate man I think; rich, handsome, lovely voice, handsome, artistic, did I mention handsome? It’s heartening to hear that there’s mainstream stuff coming out that’s a step above the typical sports fragrances. I’m going to give this one a whirl myself. Tell me about it! Noir would make a good feminine I think. Do let me know how you get on. The violet leaf is a bit much in the opening I agree. It’s bitter, astringent and a little bit watery. The opening definitely isn’t my fave part. As much as I think Noir is a great mainstream masculine release I won’t be running out to buy a bottle. I enjoy it but don’t need it. Male Shalimar? I have to check it out! On a side note, ever since the Hunger Games movie came out, I can only think about the spoiled citizens of the Capitol when I see Tom Ford’s meticulously groomed facial hair . . .